Yesterday I put the last stitch into this quilt. I used a variegated green perle cotton thread. The colors in the thread went from a barely there soft green to a dark emerald green. The stitching added some dimension to the quilt and an extra pop of color. I am really enjoying hand quilting. I am surprised by how quickly a quilt can be completed when you work on it a little bit every night. There is something about the "pop" of hiding the knot that is so satisfying. I wouldn't trade my quilter/friend, Mary, for her creativity and beauty that she brings to my big quilts. But for the throw to crib size, I don't mind hand quilting them at all. I am still keeping good on my promise to myself that for every quilt I take to Mary for machine quilting, I have to hand quilt one myself. I have one more customer t-shirt quilt to complete and then I am back to working on completing the unfinished projects, block of the month and kits that I have accumulated. It will be quite the summer for sewing and I'm looking forward to many hours of happy stitching as well as sharing more fun giveaways with you in the last six months of my monthly giveaway. I am hand piecing my first quilt and enjoying it very much. I'm not sure what color thread to use when I quilt it because I have navy blue, turquoise blue, orange, red, light purple and dark purple. I was thinking of maybe using a purple through the whole thing, but I was also wanting to do a baptist fan. Oh that is beautiful! (and the hydrangeas are lovely too!) ;-) I am a clumsy hand quilter, but I like to do small~ very small~ projects. :-) Have a happy day! That quilt is so pretty! I love when quilters photography their quilts is a lovely setting, too. 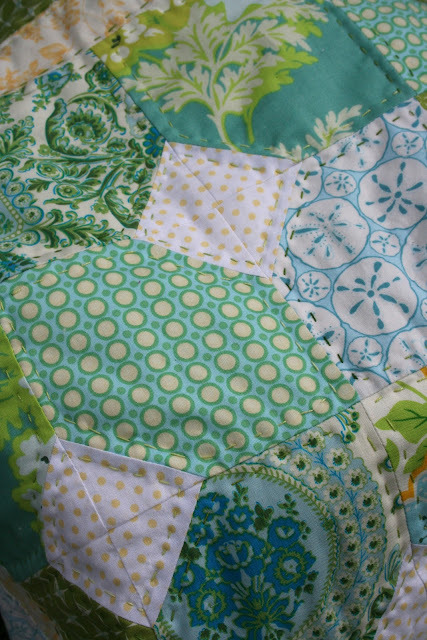 Your hand quilting is wonderful and it is such a beautiful quilt! The colors are so soothing, blues and greens. I.am.in.love.with.your.stitches!! Don't you just love the look that handquilting gives?? :o) Yours is absolutely gorgeous!!! I love your quilt Renee. It is beautiful. Renee, I absolutely LOVE your quilt! The thread you hand quilted with is the perfect color(s). Hi Renee, Not only is the quilt pattern and colors striking but girl your hand quilting is so nice-I should know since that is all I do. Love the verigated thread too. Great job; I love sitting at night quilting. Love your quilt and the hand quilting is lovely. Do you use a hoop or frame when you hand quilt or can you just hold it on your lap? I'm thinking I would like to try this sometime. Sure is beautiful. What a beautiful quilt to share on the last day of Spring. Very pretty! I love the look of the varigated thread. What size pearle cotton did you use? Your quilt is so lovely...and it looks, especially, nice with the colorful hydrangeas in the background. Love that quilt!! I so wish I could make one!!! It's totally charming Renee - beautiful, soft, pretty, just yummy! Love the name of the quilt. I'm also loving your big stitch quilting. I'm thinking of doing that with a tablerunner I just finished for the 4th. I'm thinking red floss. That last comment was me. Don't know how it posted that way. Absolutely beautiful! Love your colours and your stitching!